Achieve salon style results with the Elegant Touch Polished Nails in Garnet. The deep hued garnet nails deliver a high gloss finish and boast Ultra-Flex technology for a comfortable wear. 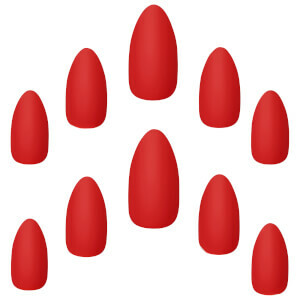 Arriving in a dark red colour, there is no need to worry about smudges or chips, the nails provide a long-lasting manicure with professional looking results. Simply file into your desired shape and glue to your natural nail. The pack contains 24 individual nails in multiple sizes, allowing you to find the perfect fit for you. Glue is included, delivering flawless wear for up to 10 days. Para aplicar: prepare as unhas com o removedor de verniz. Lime e pula. Selecione o tamanho adequado à sua unha. Coloque a cola na unha e aplique a unha falsa encostando-a à cutícula. Pressione para baixo. Para remover: lime a superfície da unha. Prepare um disco de algodão e envolva a unha em papel de alumínio. Elimine todos os resíduos.